Quadro (Italy) is a young company - managed by young people too - born with the necessity to offer solutions rather than products. We innovate because we choose to combine noble and sophisticated materials such as stainless steel together with an essential, timeless, archetypal design. A good product is nothing without a good design. HansThyge Raunkjaer, together with his team at Hans Thyge & Co., in Aarhus, Denmark, creates all our designs since the foundation of the company, back in 2001. Our products are manufactured in stainless steel AISI304 or AISI316. Stainless steel is durable, hygienic and resistant to corrosion. Much more reliable than brass in terms of environmental impact, atoxicity and resistance. • Italian Certified Quality. The range of products are guaranteed Italian origin. • High Quality raw materials. Only AISI304 Stainless Steel certified materials used to guarantee quality and anti-toxicity. Stainless Steel certification from Inox Italia to ISO 9001:2000 standard. • Durability – The alloying elements in stainless steel form a thin, transparent ‘passive layer’ on the surface. Although this passive layer is only a few atoms thick, it instantaneously reforms in the presence of oxygen from air and water. This explained why stainless steel does not require any coating or other corrosion protection to remain bright and shiny even after decades of use. • Health & Recyclability – Stainless Steel is a noble metal. It does not contain any toxic elements like lead or chrome and does not undergo any galvanic treatments unlike the process used for traditional brass taps. Stainless steel is hygienic and toxic free, it does not release any noxious elements harmful to human health. Stainless steel is 100% recyclable and is made from up to 60% of recycled materials. Qudrao Stainless Steel tapware uses no brass fittings. 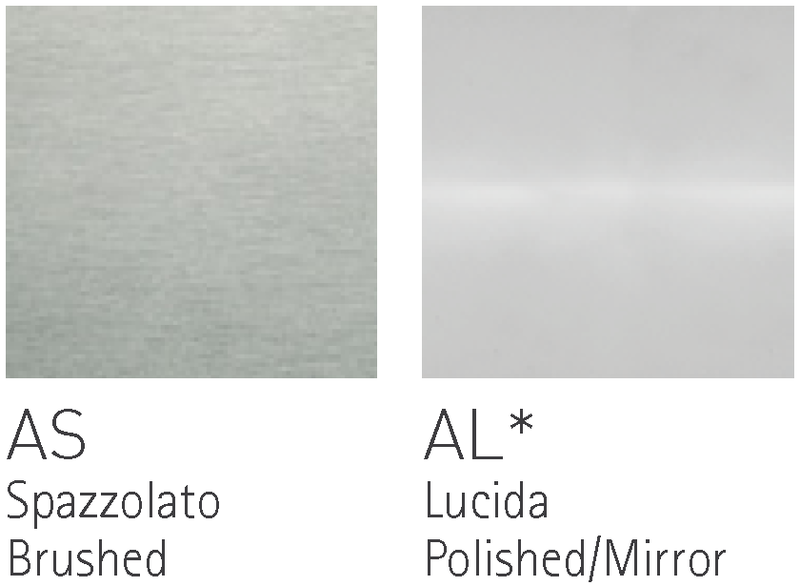 While Stainless Steel is the predominant material and focus, Quadro also manufactures a range in Brass with Chrome, Black and White finishes. factors are already determined that set the course for selection of materials, the manufacturing process, options for assembly, logistics and transport, reparaibility and return to the materials cycle. This overview shows the key aspects for the entire product life cycle that are currently applicable to Quadro. Sustainability policy. The use of a noble raw material such as stainless steel AISI 304 and 316, the flow regulators aerators perlator® honeycomb, carbon neutral packages are some of the various product components that guarantee the respect of the environment in which we all live in. Management systems - ISO 9001. Established 2000. In order to safeguard and optimize the high quality of products and processes, a far-reaching quality management system was set up as early as 2005 which has since been certified in accordance the the ISO 9001 quality management standard of the international standard organization. Products certifications. Quadro products are certified according to main internationally relevant testing and inspecting standards regarding product safety and functional integrity. Aeshetics and design. Sustainable products must be purposive. The timeless archetypal design of quadro htr ranges includes their useful intuitively operable functions and the enduring of quality of materials. Materials. The materials used are subject to stringent controls and recyclables are preffered as long-life concepts. Longevity and guarantee. The ranges set standards for product design that is sustainable in the most optimal way. The durability of the high-quality materials used, the innovative functional concepts and the archetypical understated design guarantee usability for many decades. We give a 5 year manufacturers guarantee on the cartridge with thus provides a serious planning and specify time frame. Truthfulness in product design. Ecologically oriented design principles are a natural and integral part of the product born and development. Hans Thyge Raunkjaer is active in focusing the attention on clean and minimal lines so that the beauty of the simplicity is at its maximum. Some routine maintenance and cleaning is needed to keep stainless steel surfaces in good conditions so that the aesthetics appearance and corrosion resistance are not compromised. • Mortar and cement splashes can be treated with a solution containing a small amount of phosphoric acid. Rinse with deionised water and dry. • Iron particles picked up from tools or from structural steels, scaffoldtubing, etc and steel dust created during operation such as welding, cutting, drilling must be removed immediately as steel will rust quickly. Beside corroding themselves, these particles can locally break the self healing “ passive film “ of stainless steel resulting in pitting in spite of their normally good corrosion resistance. • Soap water and a mild detergent are usually safe and successful. For more stubborn stains, cream cleansers should be effective. • Limescale: if cream cleanser is not enough, treat scale with a 25% solution of vinegar and mild hot water and give it some time to dissolve. Then clean with ( if possible deionised ) mild water and bicarbonate rinse and wipe dry as usual with care. It is very important to avoid chloride-containing cleansers, especially those containing hydrochloric acids. Hypo chlorite bleachers : if applied accidentally or poured on stainless steel surfaces, should be immediately rinsed off with fresh water; silver cleansers. Not stainless steel wire brushes.